Conditions were somewhat cold and blustery but the fish were up and eating. Usually this time of year the trout are still hunkered down in their winter lies, but on this day that was not the case. Some were up in the column in the deeper holes - suspended just below the film. While others were patrolling the flats for easy-pickins. Mostly they were keyed in on midges, but as the heat of the day progressed, a few olives started to skitter about. Once the fish started to see them, they were easy to fool on a size 18 BWO. Either a parachute or a comparadun with a clipped wing, so that it lays flush down in the film were fooling fish. 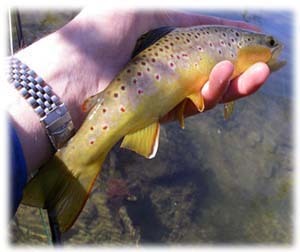 For late-February it was a really good day for SE PA wild trout fishing. With more nice weather on the way, we should see a continuation of the solid early season hatches. Look for olives and on the streams where there are early black stones, be on the lookout for them. 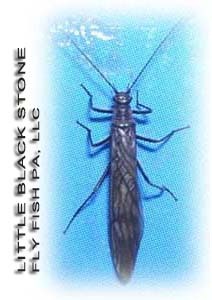 A black caddis is all you need to take fish that are keying on the early black stone. A little trick is to maybe mix in a little skittering here and there to entice a strike. Lots of times this is all it takes to induce a splashy rise! Here we are at the mid-point of the winter season and so far it has been a very friendly one for the inhabitants of our favorite trout streams. Flows have been very robust, with timely wet weather events, and the water temps have been on the warm side - relative to what they can be this time of year. I think it is safe to say the fish have been eating their way through this cold season. If you’ve been able to get out, streamers in the higher water have been moving fish. So that means they’ve remained active. It will be interesting to see if this translates to a larger average size trout this spring/summer season. We all know how much rain we had last year, so there is no doubt the fish weathered last summer well – despite some of the heat we had. I guess time will tell. This is great. Anyone who has spent just a little of time fly fishing can surely find some humor in this. 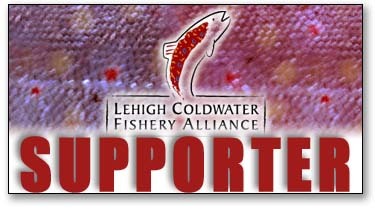 Don't forget to check out the Lehigh Coldwater Fishery Alliance booth at the Fly Fish Show in Lancaster this February 18-19. Last year it was in Valley Forge but this year the show decided to move a bit furthur west.Once again we will be doing an Orvis Rod and Reel raffle. So come out and support a good cause and try your luck on winning a new rig for the '12 season!